The lovely people at Money20/20 Europe have asked me to chair the open banking stream stream this year and I’m really looking forward to it. It’s the hottest of hot topics and they’ve got some great speakers and panelists lined up. See you there! At last! I’m in a Cartoon! Well! I gave the keynote talk at Know 2019 in Las Vegas and it showed up in a cartoon! 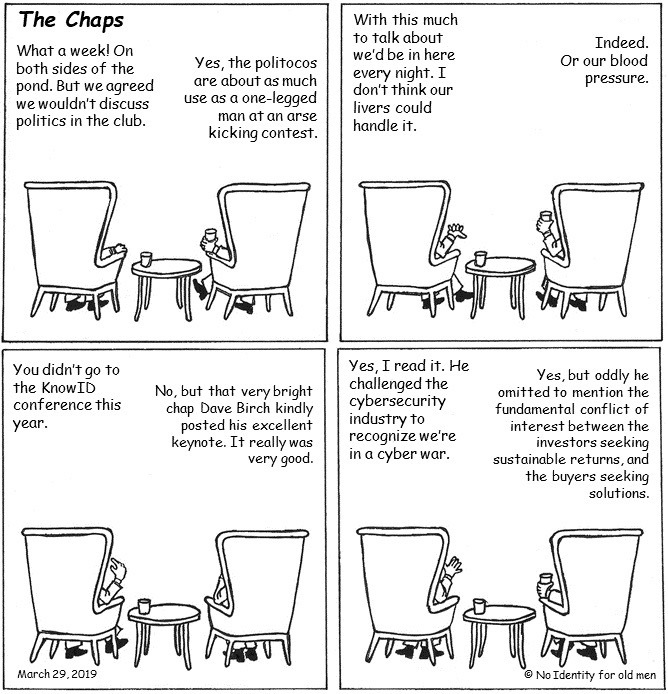 That week’s edition of Richard Parry’s “The Chaps” included kind words about my efforts and an invitation for me to deal with topic of market failure in the cybersecurity sector in a future keynote!